Graphene-Info's own comprehensive guide to graphene technology, industry and market. 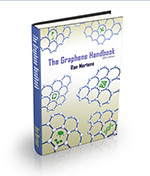 The Graphene Handbook is now available and can be downloaded now for $97 USD (via Paypal or credit card). To secure your copy simply click here. This book is dedicated to 2D materials - such as graphene, metallic chalcogenides, silicene and others such materials. The book describes their main physical properties and applications in nanoelctronics, photonics, sensing and computing. The bulk of the book deals with graphene and its amazing physical properties. Semiconductor monolayers (such as MoS2, Silicene and Germanene). Finally the book looks into 2D electron gas device physics and the applications in THz and IR region are discussed. This concise book offers an introduction and reference guide to elemental 2D materials physics with an emphasis on Silicene. It reviews the most crucial developments regarding silicene from both theoretical and experimental perspectives. The book also addresses other 2D mateials - such as germanene, stanane, phosphorene and borophene. This book focuses on carbon quantum dots, covering the structure and physico-chemical properties of quantum dots - in addition to current application and future ones. One of the chapter in the book provides information on graphene quantum dots, with several synthesis routes to makes GQDs. This book aims to explain various issues of spin transport in graphene in detail, from both basic and technical points of view, and gives us a theoretical background for understanding spintronics behaviors in graphene. The authors say that the book gives hints to overcome the the difficulties in graphene applications in the field of spintronics by comparing the physical properties of graphene and magnetoresistive (MR) phenomena in spintronics. This book, aimed at the advanced undergraduate and graduate students, introduce different theoretical methods. The book is composed of eleven chapters and of a set of detailed appendices, aiming to bring the students to the forefront of the research in the field of graphene plasmonics. This book presents the latest advances in graphene nanoelectronics and the potential benefits of using graphene in a wide variety of electronic applications. The book discusses various graphene production methods (including CVD, epitaxial and chemical methods). 2D Materials for Nanoelectronics offers a comprehensive view on 2D materials and their applications in nanoelectronic devices. Each chapter is written by a different author, and the book discusses the use of graphene for high-frequency analog circuits, explores logic and photonic applications of molybdenum disulfide (MoS2) and addresses novel 2D materials including silicene, germanene, stanene, and phosphorene. The book also covers the use of 2D materials for both field-effect transistors (FETs) and logic circuits and provides background on the simulation of structural, electronic, and transport properties from first principles.